New Red Sox pitching coach Carl Willis brings a combined 20 years of major league experience (11 as a coach, nine as a player) to his new position. TORONTO — Carl Willis takes on one of the toughest jobs in baseball Sunday when he becomes pitching coach of the Red Sox. The Sox have a 5.04 ERA, second worst in the major leagues, and a rotation loaded with question marks. Juan Nieves was fired as pitching coach Thursday and the team has give up 14 runs in the two games since. Willis, 54, has 11 years of major league coaching experience with the Cleveland Indians and Seattle Mariners. 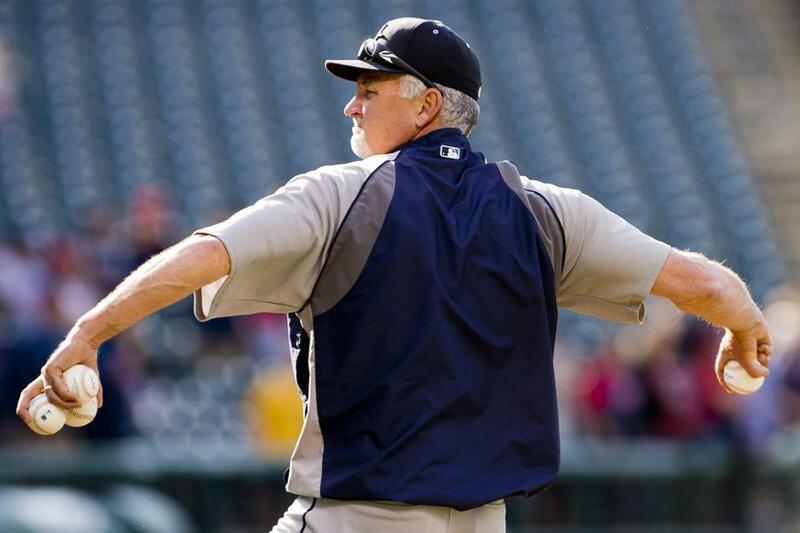 He pitched parts of nine seasons in the majors and also coached in the minor leagues. Willis was the pitching coach at Triple A Columbus, a Cleveland Indians affiliate. Indians manager Terry Francona, the former Red Sox manager, wasn’t surprised the Sox went after him. Willis coached in the Indians’ system from 1997-2009. Farrell was Cleveland’s director of player development from 2001-06 and worked closely with Willis. “Someone I’ve had working experience with from the past for a number of years while in Cleveland. Someone who’s got all the attributes we’re looking for in the position. Someone who’s had a lot of success at the major league level,” Farrell said. In Cleveland, Farrell saw Willis take a strong hand when needed, but also show compassion to struggling pitchers. “He’s hasn’t forgotten how difficult the position is of a pitcher. He’s got an ability to connect with many different types of individual personalities,” Farrell said. Outside of Rick Porcello, the Sox have four struggling starters. Clay Buchholz, who starts Sunday, is 1-4 with a 6.03 ERA. Joe Kelly, rocked Saturday in a 7-1 loss, is 1-2 with a 6.35 ERA. Justin Masterson (2-1, 5.18) and Wade Miley (1-4, 6.91) also have pitched poorly. Willis worked directly with Masterson in 2009. Righthander Edward Mujica, who was designated for assignment Friday, was traded to the Oakland Athletics for a player to be named or cash. The Red Sox will be picking up a portion of the approximately $3.8 million Mujica is owed this season. The Sox start a three-game series at Oakland on Monday. Mujica had a 4.61 ERA in 11 games this season. Shane Victorino completed a two-game rehabilitation stint with Double A Portland on Saturday and will rejoin the Red Sox here Sunday. The plan is to activate him Monday. Victorino was 0 for 3 on Saturday against New Britain and played seven innings in right field. Victorino, 34, was 5 for 35 in 12 games before suffering a strained right hamstring. The veteran could move right into the lineup when the Sox start their three-game series in Oakland. Hanley Ramirez was 0 for 4 with a strikeout in his first game since Monday, when he strained his left shoulder trying to make a play in left field. Ramirez initially was not expected back until Sunday, but took early batting practice and told coaches he was ready. He reached on an error, struck out looking, popped to right field with two runners on, and grounded out. Ramirez was not available for comment. Catcher Ryan Hanigan, who had surgery on his right hand May 2, hopes to return to the lineup by the second week of July. The team has said a late-July return is more likely. Hanigan fractured his little finger when a ball deflected off Mark Teixeira of the Yankees and struck him. For now, Hanigan is working with Blake Swihart , who is 2 for 22 with 10 strikeouts in six games since being called up. Farrell said the team is generally pleased with how the rookie has worked with the pitchers. Sunday is Mother’s Day and several Sox players will use pink bats or wear pink equipment to raise awareness and funds to fight breast cancer. The Red Sox will open Gate C at Fenway Park for the free “Walk in the Park.” The event, which runs from 11 a.m. to 1 p.m., gives fans the opportunity to walk around the warning track, sit in the dugouts, and get photos with the World Series trophies. Kids can see Wally the Green Monster, a balloon artist, and enjoy other activities. Tours are free for all moms from 9 a.m. to 5 p.m.
Mookie Betts was 2 for 5 with a double. He has hit safely in seven games and has seven extra-base hits in that stretch. The game ended when Betts hit a deep fly ball to center field that was caught at the fence . . . Brock Holt, away for two days after a death in the family, is expected to rejoin the team Sunday . . . The Sox are 1-5 in their last six series . . . The Sox have scored one run in their last 19 innings . . . Several Giants executives, including manager Bruce Bochy and GM Bobby Evans, will visit the team hotel in San Francisco on Monday to present Pablo Sandoval with his World Series ring. “Pablo was a big part of this club who helped us win three championships,” Bochy told reporters in San Francisco on Saturday.